The Maze Was Just The Beginning. It's time to go back. Fox has debuted the first trailer for Maze Runner: The Scorch Trials, the sequel from young filmmaker Wes Ball. Following up the impressive Maze Runner movie from last year, Ball has been going much bigger in scale, much more post-apocalyptic epic for this one and we finally get a glimpse at the world. The cast is back along with newcomers including: Dylan O'Brien, Kaya Scodelario, Thomas Brodie-Sangster, Giancarlo Esposito, Aidan Gillen, Barry Pepper, Lili Taylor and Patricia Clarkson. I'm really, really looking forward to this! It looks quite good. Enjoy! Maze Runner: Scorch Trials is directed by Wes Ball and written by T.S. Nowlin, both returning from The Maze Runner. 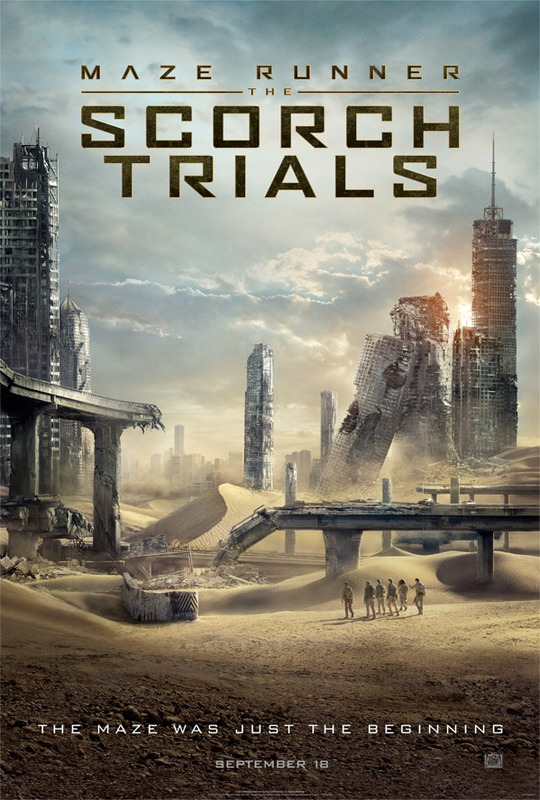 Based on James Dashner's best-selling book series, the sequel finds Thomas (Dylan O'Brien) and the other Gladers (Kaya Scodelario, Thomas Brodie-Sangster and more) as they have escaped the maze, find new groups of survivors in the outside world including Giancarlo Esposito, Rosa Salazar, Barry Pepper and Aidan Gillen, and encounter new threats beyond the maze. Patricia Clarkson and Lily Taylor also star in the film which 20th Century Fox will release early this fall in 3D, 2D and IMAX on September 18th. So? Huh! Looks good. Appears higher quality than anticipated. Yeah. I'm half way through the book and while I can already tell that the setup is completely different, it looks more exciting than what I've read so far. Spare yourself the agony of those 2 last books, not worth it. The Maze was somewhat of a cool concept but was all thrown away for the sake of 2 more books. Thanks for the warning. I haven't enjoyed this one as much as Maze Runner so I might just drop it. The first movie was mediocre at best, think I'll skip this one. The first movie was pretty enjoyable, even not knowing it was adapted from a novel series (somehow I found that out after I saw it). But I'm looking forward to seeing this, as it's the only YA franchise I'll start following. However I think my involvement for this series will be limited to just seeing it in theaters and not actually owning it on DVD. You still on DVD?? Go digital much better and less clunk around the place haha. You can still watch it on a TV, depending on what type you have. I know but you have to have a certain tv for that. Again, I'd rather have a massive physical movie collection than have a massive digital movie collection. Like if I wanted to bring one of them over to a buddy's house to watch and we can't cause he doesn't have the right tv setup and we don't want to huddle around a phone or laptop. This looks really good. Loved the books and the first movie was surprisingly good. Probably because I had very little expectations for it. Hopefully this takes it a step further. .This looks like perfect airplane movie fodder. The first one was pretty enjoyable on a sort of guilty pleasure way. I will check this one out once it's on VOD. Somebody just tell me what is going on in these movies. See there is this Maze right? Then they escape the Maze. Savvy? Then the Maze was a Maze inside a Maze. Mazeception. How fast did they crank this one out??? Jesus. As someone already said: for the sake of some lazy afternoon, why not?